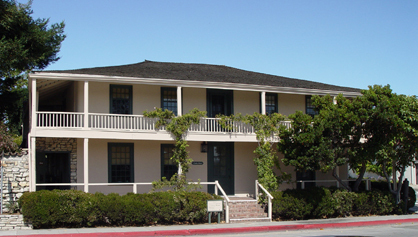 This two-story mud adobe brick home was built during Monterey's Mexican Period by Thomas Oliver Larkin. It is known as the "prototype" for Monterey Colonial architecture. Larkin was an American merchant who operated a store out of his home. He was the first and only United States Consul to Alta California under Mexican rule, serving during President Polk's administration. Acquired by Larkin's granddaughter, Alice Larkin Toulmin, in 1922, the home is filled with early 19th century antiques from many parts of the world. Today, one can tour the house and learn about this colorful and successful man from New England. Two week advance notice required for all private tours.